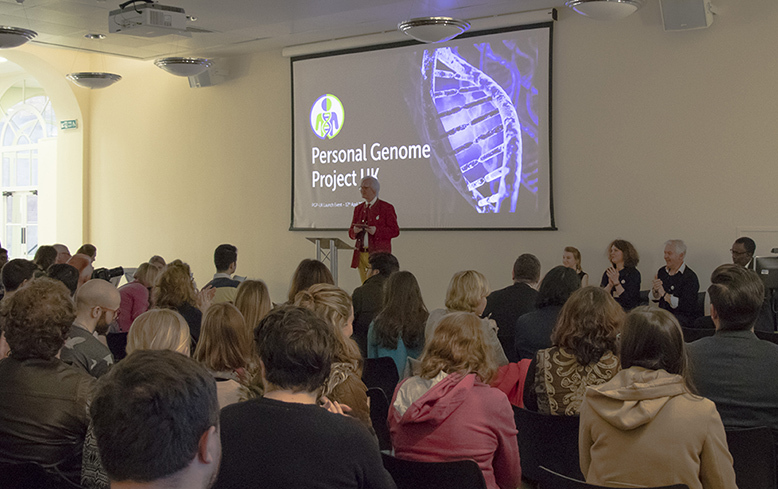 Last night, at a special launch event held at UCL, the Personal Genome Project UK celebrated the completion of the PGP-UK pilot study and unveiled ‘GenoME’ - a free educational app designed to explore personal genetic code. The new app, which was designed by Vincent Harding from UCL Health Creatives and can be downloaded from the Apple Store, enables users to explore personal genomics and the work of the Personal Genome Project UK. Part of a global network of projects, PGP-UK is dedicated to creating publicly shared UK genome, health, and trait data to aid research and scientific progress. The GenoME app explores personal genetic information with the support of four PGP-UK ambassadors who have shared their genome data and experience within the app. The evening was drawn to a close with a live performance of two unique musical pieces inspired by genetic code, composed by Trinity Laban professor of composition, Deirdre Gribbin, and performed by the Benyounes Quartet. Eye colour DNA matched to music in Deirdre Gribbin’s new composition for strings - Trinity Laban. Main image: Professor Stephan Beck presenting, with GenoME team/ambassadors (left to right) Dr Amy Webster, Dr Laura McCormack, Prof Colin Smith and Mr Momodou Semega-Janneh.